Sweden’s Moberg Pharma (OMX:MOB) is focused on maximizing the potential of its market leading position in over-the-counter sales of topical dermatology products to drive development of new therapies for the treatment of nail fungus and mouth pain, especially in cancer patients. “Our aspiration is to continue as a market leader in niche categories as we make the company strategically larger through our innovation engine and bolt-on acquisitions,” CEO and founder, Peter Wolpert, says in an interview with BioTuesdays. Moberg has a number one positions in U.S. OTC sales of its topical nail fungus product, Kerasal Nail; pain relief spray, Dermoplast; and an antiseptic liquid bandage, New-Skin. “We are expecting double-digit growth from these brands,” he adds. For the fourth quarter of 2017, retail sales for Kerasal Nail grew 17%; New Skin was up 21%; and Dermoplast up 14%. Moberg acquired Dermoplast at the beginning of 2017 and generates 60% of its sales from hospitals and 40% from retail. “We are launching a targeted marketing plan for Dermoplast, with a digital focus this year,” Mr. Wolpert says. Regarding Kerasal Nail, he says the company expects favorable market conditions in the U.S. to continue after the product’s main competitor was forced to discontinue its current marketing and change its packaging design and advertising. Mr. Wolpert says that in 2018, Moberg plans to test launch Kerasal Nail to a totally new target group: patients suffering from nail psoriasis, for which there is no OTC treatment currently available. 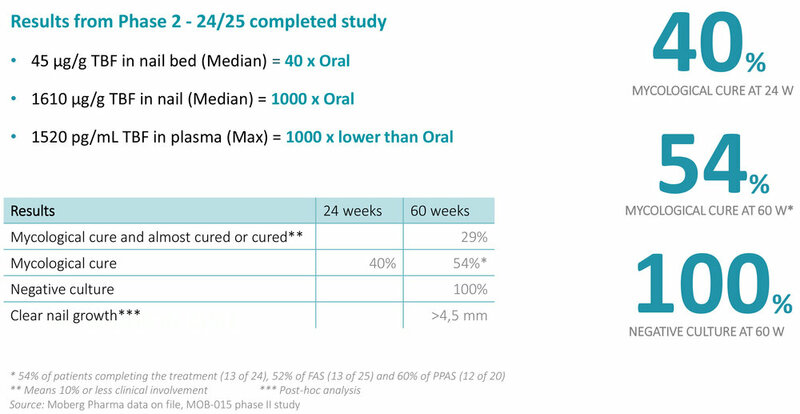 Clinical data published in 2017 demonstrated a 76% visible improvement after one week and 94% improvement after eight weeks with Kerasal Nail in psoriasis patients with nail problems, he points out. “Our ambition from the start was to make the U.S. our home market, and now some 90% of our sales are in the U.S.,” Mr. Wolpert says, noting that he and his family moved to the U.S. from Sweden in August 2017. In addition to direct sales, Moberg uses distributors to sell its nail fungus products in more than 40 countries. Net sales for 2017 rose 31% to 439 Swedish krona (about US $50-million) with underlying EBIDTA growth of 108% to 89 Swedish krona. Kerasal Nail, New Skin and Dermoplast accounted for more than 80% of net sales last year. “We believe there is plenty of value in Moberg Pharma,” Klas Palin, an analyst with Sweden’s Redeye, wrote in a research report last month after the quarterly results. MOB-015 is an internally developed topical formulation delivering high concentrations of terbinafine through the nail for the treatment of onychomycosis. Oral terbinafine is the gold standard for treating onychomycosis, but is associated with safety issues, including drug interactions and liver damage. Mr. Wolpert says Moberg is building on its leading OTC product, Kerasal Nail, to demonstrate rapid visible improvement, superior cure rates and safety with MOB-015, which has patent protection in the U.S., Europe and Japan until 2032. “This is our most valuable asset,” he adds. The two Phase-3 studies in North America and Europe are expected to enroll a total 800 patients. The company hopes to complete enrollment in the North American study in the summer of 2018 and the European study in the second half of 2018 and report data 14-to-15 months thereafter. In a previous Phase 2 study, MOB-015 demonstrated delivery of high microgram levels of terbinafine into the nail and through the nail plate into the nail bed. Mycological cure of 54% and significant clear nail growth was observed in patients who completed the Phase 2 study. In addition, 100% of patients were culture-negative at 60 weeks, “which is something I don’t think has ever been reported in this area before,” Mr. Wolpert contends. In addition, he says plasma levels of terbinafine with MOB-015 were 1,000 times lower than after oral administration, reducing the risk of liver toxicities observed with oral terbinafine. According to Mr, Wolpert, approximately 10% of the general population suffer from onychomycosis and a majority of those afflicted go untreated. The global market opportunity is significant with more than 100 million patients worldwide, including 35 million to 40 million in the U.S.
Mr. Wolpert figures that if approved, a conservative assumption is that MOB-015 has the potential to achieve 5% to 7.5% market share of some five million total prescriptions for onychomycosis. Assuming an annual selling price of $1,700 a year and trade discounts of 50% to 60%, he says the potential for net sales of MOB-015 in the U.S. would be $170-million to $300-million-plus. Including prescription markets in Japan and Canada, and OTC markets in Europe and the rest of the world, the total net sales potential would be $250-million to $500-million, he adds. Moberg’s other pipeline asset is BUPI, a taste-masked lozenge containing bupivacaine that is designed to provide better pain relief in the mouth for the treatment of oral mucositis, a debilitating side effect of radio- and chemotherapy for cancer patients, causing severe pain which can prevent patients from eating and swallowing solid food. Mr. Wolpert says that in a Phase 2 study with 39 patients, BUPI provided 50% better pain relief in the mouth than standard pain treatments. Each lozenge has the potential to provide two-to-five hours of pain relief, he adds. Moberg’s partner, Cadila Pharmaceuticals of India, has agreed to fund one Phase 3 trial of BUPI in exchange for distribution rights in India and parts of Africa. Discussions with Indian regulators are underway and Cadila hopes to begin the pivotal study in 2018. To connect with Moberg, or any of the other companies featured on BioTuesdays, send us an email at editor@biotuesdays.com.